Getting a lot of clicks directed to your website is a good indicator that your ads are performing well. However, now you actually need that traffic to do something. So with that said, do you know if you’re converting your visitors? What is your cost per conversion? Are you even tracking conversions? Are you freaking out because you don’t know any of these things? If so, you’re not alone. To simplify, conversion is just a fancy term for web leads. It is basically taking a visitor to take another small step toward your final website goal. Highlight all of your memberships, endorsements, affiliations or social follows on your home page in a banner style. For example, Voices.com, gained 400% in conversions after implementing this. A/B testing is a simple way to test changes to your page against the current design and determine which ones produce positive results. It is a method to validate that any new design or change to an element on your webpage is improving your conversion rate before you make that change to your site code. 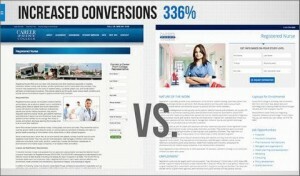 A/B test different images and layouts for your homepage or landing pages. Most companies don’t do this often enough because they’re afraid design changes will create a poor user experience. This isn’t entirely true, just limit testing to once a quarter or twice a year. Absolute Web Services has seen positive results with financial and real estate websites, where conversions have increased by over 300% after testing images, layout and form. Online shoppers like to feel secure when they are going to make a transaction online. One way of doing so is by adding a trust seal, which verifies visitors that a website is legitimate and authentic. Another necessity is the inclusion of an SSL certification to ensure consumers that their credit card information is not going to be intercepted and misused. More and more customers are becoming savvy online shoppers and won’t buy from you if you don’t have an SSL certificate installed. Add credibility by including a trust logo such as VeriSign, Norton or BuySafe on your checkout forms. Most companies see on average a 32% increase on successful checkout form completions. Simple wins over complex. Shortening forms almost always yields higher conversion rates. By using only necessary form fields can significantly increase the conversion rate of your contact form. A report from HubSpot recently researched the contact forms sent out to 40,000 of their customers found that conversion rate improves by almost half when the number of form fields are reduced from four fields to three! So now that you know the tactics to increase profit for your appropriate audience, it’s time to measure the results. The tools such as Optimizely along with Google Analytics will give you great data for determining what’s truly successful or not.